Blake M. Treinen (/ˈtraɪnɛn/, born June 30, 1988) is an American professional baseball pitcher for the Oakland Athletics of Major League Baseball (MLB). He played in MLB from 2014 through 2017, when he was traded to Oakland. Treinen was an All-Star in 2018. Treinen attended Osage City High School in Osage City, Kansas. He played for the school's baseball team as a freshman, but quit during his sophomore year as he developed prediabetes. He returned to the team in his junior year, with his fastball reaching 79 miles per hour (127 km/h). He enrolled at Baker University, where he played college baseball for the Baker Wildcats in the National Association of Intercollegiate Athletics in 2007. He transferred to the University of Arkansas in 2008, but did not play for their baseball team. He attempted to walk on to the Arkansas Razorbacks baseball team in the National Collegiate Athletic Association (NCAA), but was denied the opportunity to try out. He began weight training. During Christmas break, Treinen participated in a baseball training camp led by Don Czyz, a retired Minor League Baseball pitcher. Czyz recommended Treinen to Ritchie Price, the head coach of the South Dakota State Jackrabbits baseball team. Treinen transferred to South Dakota State University to continue his college baseball career with the Jackrabbits. He had to sit out in 2009 due to the NCAA's rules on transfers. By the time he was able to pitch for the Jackrabbits, his fastball averaged 87 to 88 miles per hour (140–142 km/h). The Miami Marlins selected Treinen in the 23rd round of the 2010 MLB Draft. Though Treinen was willing to sign, an MRI revealed shoulder inflammation, and the Marlins withdrew their offer. In 2011, his senior year, Treinen had a 7–3 win–loss record and a 3.00 earned run average (ERA). During the season, his fastball reached 97 miles per hour (156 km/h). The Oakland Athletics selected Treinen in the seventh round of the 2011 MLB Draft. He signed with Oakland, receiving a $52,000 signing bonus. Pitching for the Stockton Ports of the Class A-Advanced California League in 2012, Treinen had a season he called "subpar" and "mediocre", in which he had a 4.37 ERA in 24 games pitched, 15 of which were starts. Before the 2013 season, the Athletics traded Treinen to the Washington Nationals in a three-team deal, in which Washington also received A. J. Cole and Ian Krol, Oakland received John Jaso, and the Seattle Mariners received Michael Morse. With the Harrisburg Senators of the Class AA Eastern League, Treinen had a 3.64 ERA during the 2013 season. The Nationals invited Treinen to spring training in 2014, where he impressed Nationals' coaches. He began the season with the Syracuse Chiefs of the Class AAA International League, and was promoted to the major leagues on April 12. He earned his first career win on June 29, making a spot start against the Chicago Cubs and out-dueling Jeff Samardzija in a 7–2 win. During the 2014 Washington Nationals season, Treinen appeared both as a starting pitcher and out of the bullpen, with his fastball clocked as high as 98 miles per hour (158 km/h). Splitting the season between the Nationals and the Chiefs, Treinen had a 2.49 ERA in 15 major league games and a 3.35 ERA in 16 minor league games. For the 2015 season, Treinen started the year in the Nationals bullpen, with the off-season acquisition of Max Scherzer creating a crowded rotation picture. Manager Matt Williams, dealing with injuries to his veteran relievers, began inserting Treinen into high-leverage, late-game situations in early April, occasionally setting up for closer Drew Storen. He also reached 100 miles per hour (160 km/h) with his sinker for the first time in his major league career during the first half of the season. Treinen remained with the Nationals for much of the year, posting a 3.86 ERA with a 2–5 record with 65 strikeouts for the season. He was optioned back to Syracuse on June 20 after struggling with command for the first half of the season. Upon being recalled the next month, Treinen told The Washington Post that being sent down "was probably the best thing that could have happened" in allowing him to work on his approach. However, even late into the season, Treinen was noted for struggling to retire left-handed batters, ultimately giving up the final run of the Nationals' season on a solo home run by left-hitting New York Mets outfielder Curtis Granderson in a 1–0 loss to the eventual World Series runners-up on October 4. In the Nationals' 2016 season, Treinen posted a 2.28 ERA on the year and narrowed his platoon splits versus left-handed hitting. He credited veteran teammate Matt Belisle and the Nationals' new pitching coach, Mike Maddux, for helping him improve his craft, while Maddux described Treinen's progress over the course of the season as "puppy dog to bulldog". Treinen led the National League in groundballs induced with 65.9% on the season and ranked highly in inherited runners stranded and soft contact created, among other metrics. Treinen was frequently used in situations in which another Nationals pitcher had allowed one or more baserunners and manager Dusty Baker was seeking a double play ball, a role in which he excelled with his high-90s sinker. He remained with the Nationals for the entire year, working exclusively out of the bullpen, and made his first playoff appearance for the team, being credited with the win in Game 2 of the Division Series against the Los Angeles Dodgers and taking the loss in Game 4. With the departure of Mark Melancon to free agency, the Nationals named Treinen their closer for the 2017 season. On Opening Day, Treinen pitched a perfect inning in the top of the ninth against the Miami Marlins with two strikeouts to end the game, earning the save, the second of his career. However, the Opening Day performance was the first and last clean inning Treinen would pitch in the entire month of April. He gave up an earned run while notching his second save of the season on April 5 against the Marlins before blowing a save against the same team the following day. After just a couple of weeks as the closer in which he posted a 7.11 ERA, Treinen was removed from the role in favor of Shawn Kelley and later Koda Glover. In June, Treinen's batting average on balls in play against him gradually regressed toward his career norms. However, with both Kelley and Glover on the disabled list, fellow setup men Enny Romero and Matt Albers unavailable, and acting manager Chris Speier in need of a reliever to close out the ninth inning of a 4–2 game against the Chicago Cubs on June 29, Treinen was called upon for his first save opportunity since being demoted from the position of closer. He proceeded to give up three earned runs for a blown save loss as the Cubs came back to win 5–4. On July 16, 2017, the Nationals traded Treinen to the Athletics, along with Sheldon Neuse and Jesus Luzardo, for Sean Doolittle and Ryan Madson. At the time of the trade he was 0–2 with a 5.73 ERA and three out of five in save opportunities converted over 37 appearances. As the Athletics' closer, he converted 13 of 16 save opportunities after the trade. In early September, Treinen took three losses in a row, but the A's rallied for two runs in the bottom of the ninth to walk off, and Treinen got credited with the win instead. In the first half of the 2018 season, Treinen had a 5–1 record with a 0.79 ERA and 23 saves. He was named an All-Star. He finished the season with a 9-2 record, 38 saves and a 0.78 ERA. Treinen and the Athletics went into salary arbitration before the 2019 season, and Treinen won, earning a $6.4 million salary for the season. Treinen is married to Kati and owns a bulldog, Maxx. Treinen is a devout Christian. ^ "A's draft Osage City product Treinen". Topeka Capital-Journal. Retrieved March 21, 2014. ^ a b c d e Kilgore, Adam (June 2, 2014). "Washington Nationals' Blake Treinen takes slow road to throwing fastballs in majors". Washington Post. Retrieved February 25, 2016. ^ a b c Wagner, James. "Blake Treinen impressing in Nationals camp". Washington Post. Retrieved March 20, 2014. ^ a b "Scouting reports on the return in the Michael Morse trade: A.J. Cole and Blake Treinen". Washington Times. January 16, 2013. Archived from the original on October 9, 2013. Retrieved March 20, 2014. ^ "Blake Treinen makes his return for first-place Harrisburg Senators Tuesday night vs. Altoona". The Patriot-News. August 27, 2013. Retrieved March 20, 2014. ^ a b Dan Kolko (March 4, 2014). "Nationals Pastime: How a trade and a season at Double-A jump-started Blake Treinen's career". MASN. Retrieved March 20, 2014. ^ Kilgore, Adam (January 16, 2013). "Nationals trade Michael Morse for A.J. Cole in three-team deal". Washington Post. Retrieved July 14, 2013. ^ "Blake Treinen ‘continues to impress with elite velocity, presence". Washington Post. March 21, 2014. Retrieved March 22, 2014. ^ Wagner, James (April 12, 2014). "Nationals call up Blake Treinen to add fresh arm to the bullpen, Aaron Barrett sent down". Washington Post. Retrieved April 13, 2014. ^ "Nationals beat Cubs 7–2 for day-night DH sweep". USA Today. June 28, 2014. Retrieved June 30, 2017. ^ Sickels, John (May 30, 2014). 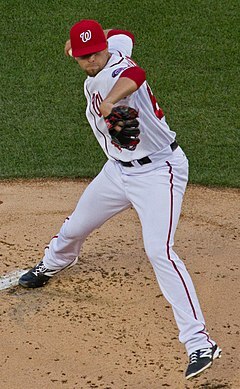 "Prospect of the Day: Blake Treinen, RHP, Washington Nationals". Minor League Ball. Retrieved June 30, 2017. ^ Garrison, Danny (February 28, 2015). "Washington Nationals: 4 Players Who Are in Serious Danger of Being Cut or Demoted". Bleacher Report. Retrieved June 30, 2017. ^ Schad, Tom (April 8, 2015). "In high-leverage situation, Blake Treinen continues to impress". The Washington Times. Retrieved June 30, 2016. ^ Schaal, Eric (June 6, 2015). "8 MLB Pitchers Throwing 100 MPH or Faster in 2015". Sports CheatSheet. Retrieved June 30, 2017. ^ Wagner, James (August 23, 2015). "Blake Treinen: 'Going to Syracuse was probably the best thing that could have happened'". The Washington Post. Retrieved June 30, 2017. ^ Reddington, Patrick (September 25, 2015). "Nationals' reliever Blake Treinen's struggles vs left-handers continue in loss to Orioles". Federal Baseball. Retrieved June 30, 2017. ^ Janes, Chelsea (October 4, 2015). "Nationals end the season as it began by falling to the Mets". The Washington Post. Retrieved June 30, 2017. ^ Reddington, Patrick (February 9, 2017). "Nationals' Blake Treinen makes transition from puppy dog to bulldog". Federal Baseball. Retrieved June 30, 2017. ^ Dybas, Todd (March 30, 2017). "Blake Treinen will close for the Nationals". The Washington Post. Retrieved June 30, 2017. ^ "Dodgers defeat Nationals in Game 4 of NLDS, 6–5". Los Angeles Times. October 11, 2016. Retrieved June 30, 2017. ^ Janes, Chelsea (March 30, 2017). "Nationals choose Blake Treinen as their closer". Washington Post. Retrieved April 5, 2017. ^ "Harper, Lind homer, Nationals top Marlins 4–2 in opener". ESPN.com. April 4, 2017. Retrieved April 5, 2017. ^ Fendrich, Howard (April 5, 2017). "Bryce Harper's 2 RBI, Ryan Zimmerman's HR lead Nationals over Marlins". The Washington Times. Retrieved June 30, 2017. ^ Zuckerman, Mark (April 6, 2017). "Nationals relievers cope with first blown lead of 2017". MASN Sports. Retrieved June 30, 2017. ^ "Nationals' Dusty Baker removes Blake Treinen from closer's role". ESPN. April 19, 2017. Retrieved June 30, 2017. ^ Kerr, Byron (June 28, 2017). "Treinen hoping to build off of positive recent results". MASN Sports. Retrieved June 30, 2017. ^ Reddington, Patrick (June 28, 2017). "Nationals' sinker-baller Blake Treinen back to throwing unnatural sinkers again..." Federal Baseball. Retrieved June 30, 2017. ^ Paras, Matthew (June 29, 2017). "Nationals give up three in 9th, lose 5–4 to Cubs". The Washington Times. Retrieved June 30, 2017. ^ Janes, Chelsea (June 29, 2017). "Bullpen melts down again as Cubs rally to beat Nats, 5–4". The Washington Post. Retrieved June 30, 2017. ^ "Nats acquire Doolittle, Madson from A's". MLB.com. July 16, 2017. Retrieved July 16, 2017. ^ Weinrib, Ben (July 8, 2018). "Athletics Blake Treinen named as All-Star". MLB.com. Retrieved April 25, 2019. ^ a b Bitker, Janelle (February 2, 2019). "A's closer Blake Treinen earns historic raise in arbitration case". SFChronicle.com. Retrieved April 25, 2019. ^ Matz, Eddie (February 24, 2016). "Maxx and Me: Nationals' Blake Treinen treks across America – with his bulldog". ESPN.com. Retrieved February 25, 2016. ^ Janes, Chelsea (March 6, 2017). "Blake Treinen may well prove that nice guys can finish the last inning". The Washington Post. Retrieved June 30, 2017. This page was last edited on 25 April 2019, at 04:58 (UTC).